Removing the Lioning's 14-degree bow would convert the ship into "a training platform to fly warplanes for China's next generation aircraft carrier, the Type 002," an unnamed retired PLA Navy officer told the South China Morning Post Sunday. Yet the prospect of electromagnetic catapults on Liaoning remains "just a proposal," the anonymous officer said. It's not actually clear that China has developed electromagnetic catapults that could be directly installed onto the Liaoning, but Chinese military expert Zhou Chenming told SCMP that shipbuilders have determined the Liaoning is "compatible" with a refit. According to South China Morning Post, though, the new Type 002 will have electromagnetic catapults and conventional propulsion systems like Liaoning and its sister ship, the Type 001A. Beijing seeks electromagnetic catapults to launch aircraft at a greater clip while stocking each aircraft with more weapons and fuel, the report says. Song Zhongping, a military expert in Hong Kong, told the publication that "refitting work is too comprehensive and too complicated," adding that he doesn't think it's required "to do such a difficult project." Zhou said the biggest obstacle may be time instead of capital, noting that until the refit was complete, it would take the ship off the seas, thus limiting the amount of time pilots have to train from the carrier. Of the three aircraft carriers China has publicly revealed, the Liaoning, Type 001A and Type 002, the Liaoning and the Type 001A both utilize an inclined bow to help fixed-wing aircraft take off from the ship. Construction of the Type 002 is not expected to be complete until 2025, as shipbuilders just started on the massive vessel last November, Sputnik reported. 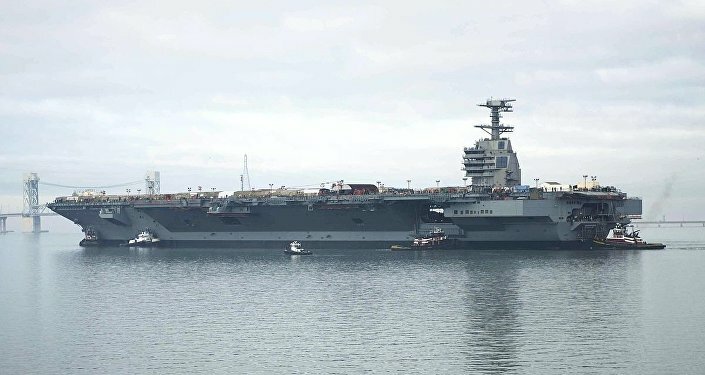 The US Navy's USS Gerald Ford was the first to make use of EMALS instead of steam catapults or the ski-jump, but the electromagnetic launch system is still of "poor and unknown reliability," the US Department of Defense's director of operational testing said last month. In addition to pilot training, Sputnik has reported that the Chinese Navy does not have enough carrier-based aircraft to fill a squadron on the Type 001A. The service evidently only has about 40 Shenyang J-15 fighters, and the Liaoning carries about 26 J-15s, while the other 14 aircraft aboard the Soviet-built hull are rotary-wing aircraft, or helicopters. Lt. Gen. Zhang Honghe, deputy chief of the PLA Air Force, said a new a J-15 replacement is under development last July. Still, Russian military expert Vasily Kashin told Sputnik at the time that the J-15 is not going anywhere anytime soon, saying that Chinese naval aviators will have to "make do with the J-15" until the first carrier-based J-31s are reach an initial state of combat readiness. Khashin noted he does not expect for the J-31s to be ready by the mid-2020s.